I've seen a million plus style quilts. I've seen scrappy ones, and modern looking ones. I've seen them with lots of space between the pluses and no spaces at all. I bought this pattern in 2014. Yes, that's right. 2 years ago and then some. One holiday vacation, I did all of the cutting. I posted pics of the tiny pieces on my Instagram feed. That was December 2014. Next week, it's December 2016. Every time I get a break between projects, I go back to it. I was doing 10 blocks at a time. I could crank them out in about an hour and 15 minutes. But I didn't really seem to be making a dent in how many I needed. 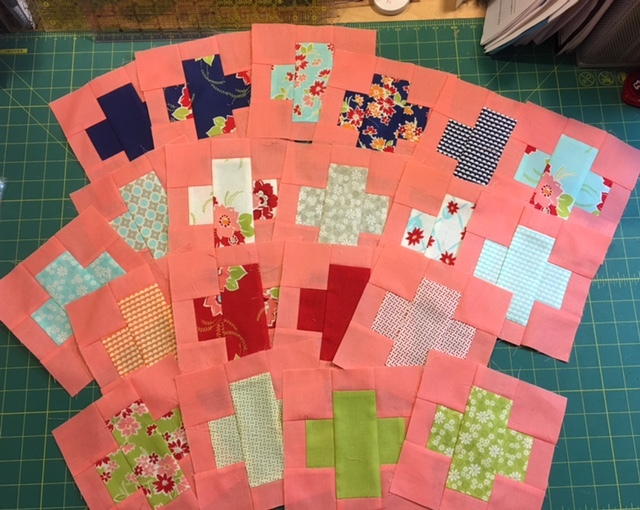 My eyes were WAY bigger than my stomach, and I cut enough fabric for a twin size quilt. So, in my new line of thinking, which is to say, DONE is better than BIG, I looked at the pattern and lo and behold, if I made all of the blocks, I'd have enough for THREE baby size quilts, and I could make two of them, RIGHT NOW. That, my friends, is appealing. Then I think, would I really want three quilts that are pretty much the same? They WOULD make awesome baby gifts. Now I can't decide. Do I forge on? For another year? And make the twin? Or do I give myself a little satisfaction and put together the two baby tops I have enough for now, and work on the 3rd (which will seem VERY achievable) in the future?